This very picturesque, immaculately-conditioned, tree-lined course is a pleasure to play and, as one Randpark member observed, even if you’re not on your game it is a very pleasant walk! It is shorter than neighbouring Firethorn but because of the abundance of trees lining the fairways there are some tight holes as well as some extremely challenging ones. There is a wide variety of holes and no two holes are remotely alike. No 1, par-5, 474m: Trees and bunkers left and right may catch the wayward drive but hit one up the middle and you’re set yourself up nicely for a par on this fine, fairly forgiving opening hole. A huge rock on the right near the green must be skirted though. The big hitters can turn this hole into a two-shotter, especially since the entrance to the green slopes steeply downward. No 2, par-4, 376m: A demanding dog-leg right, three nasty fairway bunkers all in a row will gobble up anything hit slightly right. So left of the fairway is the ideal spot to land the tee-shot. The green slopes sharply down from left to right and stopping a super-quick downhill putt is a real test. Make par here and give yourself a pat on the back. No 3, par-5, 448m. Easy on the eye but not on the wayward shot. Towering trees on the right and a fairway bunker left make for an exacting drive. The approach to the green, whether it’s your second or third, is fraught with danger as a pond lurks uncomfortably close on the right and a strategically placed bunker on the left about 50m short of the green draws golf balls like a magnet. This is a classic risk and reward hole and if your gamble pays off you might make birdie, but if it doesn’t you might get wet and you’re looking at a bogey six followed by, oops, was that a nasty word? 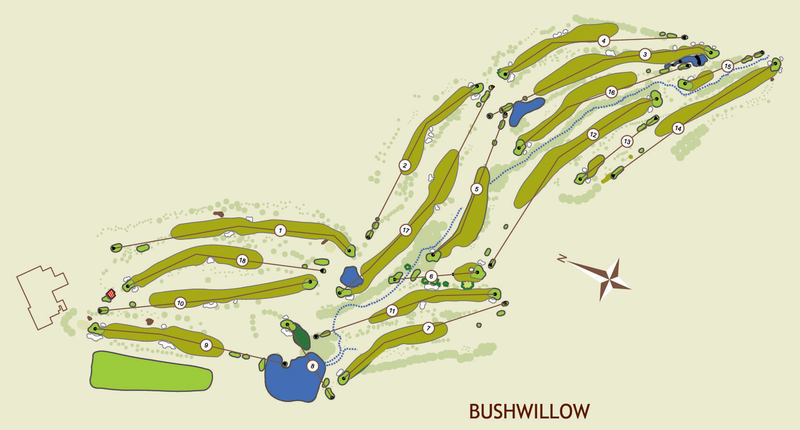 Regulars at Randpark will agree that No 1 and No 3 on Bushwillow are two of the most enjoyable par-5s you’re likely to come across. No 4, par-4, 386m: Unless your drive is a particularly long one, tall trees on the left of this dog-leg will block your approach to the green even if you’re on the fairway but left of centre. There’s also a large fairway bunker on the right, so the key here is threading your drive carefully past the trouble. No 5, par-4, 302m: Too few courses have fun-to-play short par-4s and this gentle dog-leg right is definitely one and is an absolute delight. There is a stream lurking dangerously on the right but this hole invites you to hammer a drive down the left leaving a short second, although the branches of a big tree almost overhang the left side of the green and must be avoided. It’s a 10/10 knockout little hole. No 6, par-3, 156m: A pretty hole with the green protected by a bunker short left and another over the back of the putting surface. One way to play this hole is to aim the tee-shot just right of the green and watch your golf ball roll down off the slope and feed towards the heart of the green, as you shout “get close!” or, better still, “get in the hole!” You never know, it might happen. No 7, par-4, 360m: A right-to-left dogleg with tall, thin trees on the left blocking the approach to the green even if you’re on the fairway, but a bit too far left. A drive to the right, even in the semi-rough, opens up the hole which slopes downhill for about 250m and then uphill to the green. No 8, par-3, 162m: It’s a compulsory 120m carry over water (pretend it’s not there if you’re anxious) to a big green protected by sand traps short left and back right. No 9, par-4, 388m: The driving range and out-of-bounds lurk on the left and the best strategy here is to aim at the right fairway bunker and hit a little draw. Like many Randpark Club holes, the green is protected by bunkers left and right. It’s quite a robust par-4 and you’re halfway through the round after playing nine quite splendid holes. It’s also the easier of Bushwillow’s loops, and sterner challenges await once you’re done with the welcoming halfway house. No 10, par-4, 426m: Okay, the young “Gorillas” might not find this hole, which was once a par-5, long, but the majority of club golfers will struggle to reach the green in two, especially since it’s slightly uphill. The green is an enormous one with an exaggerated left to right slope, so ultra-long putts with big breaks are not uncommon. Par here is a great score and five is not bad either! No 11, par-4, 366m: Accuracy of the tee is paramount to avoid trees and a bunker right, and a trap on the left. A pin on the front of the green is difficult to get to as there’s a little uphill slope just short of the putting surface and you can easily get “stuck” in the kikuyu there if you’re trying to be too cute in a bid to cosy up your approach close to the flagstick. No 12, par-5, 496m: Cool nerves are needed at this demanding par-5. Again, trees left and right must be avoided and a badly hooked shot could land up in the stream that runs parallel to the hole. Find the green with three good strikes and you can allow yourself a little smile, provided the pin isn’t on the extreme right and you’re on the extreme left (or vice-versa) as then you’re in possible “three-whack” territory as the putt is a particularly long one. No 13, par-3, 182m: Leafy Bushwillow’s back nine isn’t getting any easier. The tee-shot here must be precisely hit as bunkers left and right make for a seriously narrow entrance to the green. So par is hard-won and if you make birdie, well, you’d be completely justified in allowing yourself a Gary Player-style fist pump. Oh yeah! No 14, par-4, 396m: And as far as difficulty goes, there’s little let up here. For most Average Joe golfers this is a fairly long hole requiring two solid shots in order to get up in two. The sloping green is surrounded by three bunkers, one just short and left – an evil little trap which devours golf balls. No 15, par-3, 154m: A brief respite? Possibly, but don’t go left because that’s where the stream is. And a bunker short right will most likely catch a tee-shot hit with a push or weak fade. No 16, par-4, 378m: A great championship hole, stroke 1 on the card with plenty of trouble abounding. The ideal is usually a sweetly hit draw as the hole curves from right to left. But the stream runs the entire length of the hole on the left so pulled or hooked shots are a big no-no. There’s also huge, mature trees on the right as you get nearer to the green. If you’re on the right of the hole you may need to hit a towering approach over the high tree-tops, or a low punch-like shot under the branches. Both not easy. No 17, par-5, 496m: Intimidating, daunting, unnerving, treacherous. Pick your adjective, they all work. The drive is tight because of tall trees on the left and a bunker right. The second – for most of us – is a long shot down the fairway short of the lake that fronts the green. Then the old saying “be afraid, be very afraid” applies for – again – the majority of us mortals. The approach over the water is extremely exacting as the green is relatively narrow back to front and therefore a small target, with a bunker left and trouble (that ever-present stream) over the back of the putting surface. You have to get your distance just right, then trust yourself, be confident, execute and hope for the best. Getting up in two here is reserved for the Dustin Johnson and Rory McIlroys of the golf world. No 18, par-4, 384m: This testing nine ends with another tricky dog-leg hole, made so by trees too close for comfort on the left (all you can basically do is chip out sideways) and a fairway bunker right in your eye as you stand on the tee. The second half of the hole, though, slopes gently and invitingly downhill with the green in full view. Get the shot just right, find the heart of the green and hole for a brilliant birdie. Easy game! And the welcoming 19th hole awaits! Click here to download a larger version of the course layout.